At the present time, to join a Barbershop group in France is a veritable combat course. The style is emerging little by little but remains largely unknown to the general public. The websites you find when you search for music are loaded with pop, rock and jazz – so it is a struggle to get a Barbershop announcement out to the public. 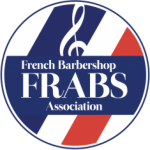 So we have created the French Association of Barbershop Singers along the same lines as Finland (FABS), Spain (SABS), Ireland (IABS), Society of Nordic Barbershop Singers, (SNOBS), Germany (BinG), the Netherlands (DABS) and Great Britain (BABS) have done. These groups have broken ground before us and are helping us create our organization. Our goal is to encourage the development of Barbershop singing in France. To do so, we need increase the awareness of the Barbershop style of singing through public concerts (including singing in the Metro), coaching singers and in parallel help groups that already exist – by providing documentation and guides, (primarily through this website), and providing contacts between existing groups and singers looking to find or to create a Barbershop chorus or quartet. And to organize Barbershop events in France to start with, and eventually to participate in European and US events when the FrABS singers have developed sufficiently. We are a handful of Francophone and Anglophone singers in the Paris region, Brittany, Lyon, Nice, England and even the US, unified by the same passion for close harmony a cappella. Contact us to take part in our adventure. How can you join FrABS? HelloAsso encourages you to give a tip when doing the payment. FRABS only receives the membership fee, without the tip and it’s not mandatory to give a tip To HelloAsso, it’s at your discretion ! We will send a newsletter very other month and only to our members, and discounts on events (workshops …) organised by FRABS. Members also get invitations for the many barbershop conventions in Europe, on the “First-Come, first served” principle , when we received these invitations ! In becoming a member of FrABS, you join a worldwide community of passionate singers and you help us grow !